As the center for gaming and horse racing in Arkansas, Hot Springs has always had a way of picking a winner. The opening of the new Northwoods Trails show the Spa City is betting big on mountain biking as the city’s latest amenity for locals and visitors alike. The new 14-mile, $1.5 million multi-use stretch offers trails for all levels, green, blue and black, with one of the black trails designed by pro rider Randy Spangler. 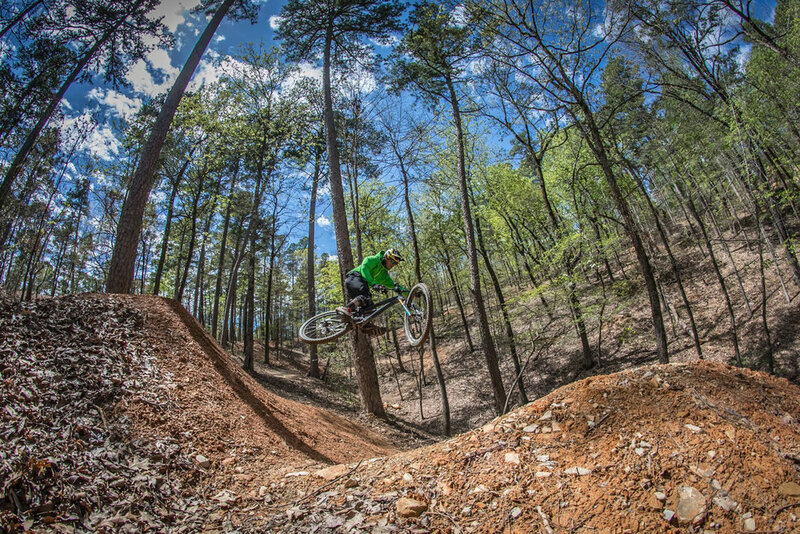 Located just north of the city, Northwoods connects to the existing Cedar Glades Park trail, to create a continuous 24 miles of mountain biking. The trail will officially be christened with a weekend celebration Nov. 16-18, with a public ribbon cutting, group ride, beer, food trucks and live music. The event coincides with the Hot Springs Running Festival set for downtown on Saturday and Attila the Hun bike race at the Cedar Glades on Sunday. Bill Sollender, director of marketing for Visit Hot Springs, said the project took a year of planning and construction as part of an even bigger vision for raising the city’s profile for cycling enthusiasts. LOCATION: About an hour southwest of Little Rock. For more information visit hotsprings.org, 501-321-2277. Sollender said Northwoods has particular potential to be transformative for the city. Given its proximity to downtown, it could provide unparalleled access to the everyday resident and firmly position cycling in the public consciousness in a way few Arkansas cities can match. Congress established Hot Springs Reservation in 1832 to protect the natural springs flowing from the southwestern slope of Hot Springs Mountain. Known for its 47 thermal springs, this national park is the nation’s oldest, predating Yellowstone by 40 years. Check out the Gulpha Gorge Recreation Area and campground for scenic drives, hot water cascades and thermal-feature tours in the summertime (hot.springs.national-park.com). Hot Springs is experiencing a rebirth in its historic main drag, bringing new energy to one of the most unique streets in Arkansas. Grab a brew at Superior Bathhouse and Brewery (superiorbathhouse.com), the first brewery to be located inside a national park. Visit DeLuca’s (delucashotsprings.com) for what’s consistently ranked the best pizza in Arkansas and among the best in the nation. Hot Springs specializes in the unexpected. Take in the Gangster Museum of America (tgmoa.com) to learn of the city’s wild past as a playground for the mob, then party like Capone at the Ohio Club (theohioclub.com). Learn about the era when pro baseball legends held spring training here (hotspringsbaseballtrail.com). You can even find alligators at the Arkansas Alligator Farm and Petting Zoo (alligatorfarmzoo.com) because why not?